BANGI, 30 October 2014 – Universiti Kebangsaan Malaysia (UKM) will confer PhD (Doctor of Philosophy) degrees to 522 people at its 42nd convocation this year from this Saturday. This is the largest number of PhDs to graduate from UKM in a year since its inception. 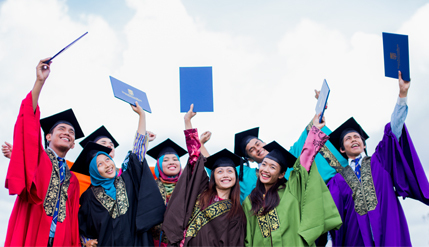 In addition a total of 2,243 of its students will receive their Masters degrees, also a record for UKM. All together, a total of 6,266 students are graduating at its 42nd convocation stretched over four days until Tuesday. Among them are 570 students from the Faculty of Science and Technology – the largest number to graduate from a faculty this year – who will be awarded their Bachelor’s degree. The Faculty of Islamic Studies will have the second largest number at 528 students for their Bachelor’s degree, followed by the Faculty of Economics and Management with 525 students. The Faculty of Humanities and Social Science will have 408 students graduating Bachelor’s degree while 262 students from the Faculty of Medicine will receive their MD.